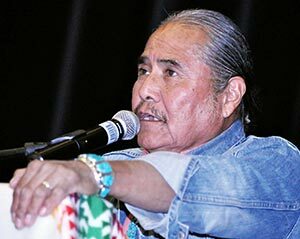 Should Duane “Chili” Yazzie make another run for president? In this election year, a lot of tribal leaders are being approached about taking the step to fill certain needs that are not being addressed and Yazzie said in a recent email, he’s getting that kind of attention. It all began back in January when he was in Flagstaff at a meeting sponsored by various grassroots organizations on the reservation. They talked about all sorts of issues, including water rights, uranium mining and pollution. “We talked about helping someone get in office that would be ‘friendly’ on these issues and we talked about candidates and potential candidates. We could not see a candidate who would ‘fit the bill’ so they said, ‘How about you?’” Yazzie said. “They focused on me and I’ve put forth every reason why I should not be the candidate, such as ‘I have a farm to tend to,’ ‘I like my job at the Shiprock Chapter,’ ‘I don’t want to leave Shiprock and my grandkids,’ ‘I’m getting on in my years, I will be 64 this year,’ etc.,” he added. The idea caught on among the grassroots members, in part because there was no one out there at the time - and since - who seemed to be addressing these issues. Yazzie, who has spent almost his entire adult life in tribal politics and as a supporter of the grassroots, was pushed continuously in February and March to consider running, in part because people were afraid that these issues would not be brought up in campaigns that stressed the creation of jobs and more homes for the veterans and elderly. “My last resort was to say, ‘I will not say yes by myself. I belong to my family and my community, so you need to ask my family and constituents.’ They turned that into a ‘vetting’ process that is consistent with the Diné way of seeking a person to do an important service,” Yazzie said. “They established an exploratory committee and they came to visit with my immediate family on March 22. They presented their thoughts on why they believed Chili Yazzie should run for Navajo Nation president. The family did not say yes or no, but the reception was positive,” he added. Yazzie said the decision-making process will continue at a meeting set for Saturday beginning at 9 a.m. at the Shiprock Chapter House where these grassroots leaders will make a formal request of his family and members of the Shiprock community “to let me run." A decision will be made on that date, said Yazzie, adding that there is a possibility that his family and members of the Shiprock community could say no.